After introductions by No Maddz’s Sheldon Shephard, who advertised his new dub poetry book In the Morning Yah and Debbie Bissoon from Tuff Gong, the two hosts bigged up Uncle Ronny, the soundman who built the mighty sound system that would vibrate through everyone’s bones that night. Uncle Ronny, by the way, also built the sound systems for Kingston Dub Club’s Rockers Sound Station. The first band, which was actually hitting the stage was Phuzzion who lived up to their name fusing different genres around reggae. The band performed their new single Pon the Rocky Road while in the distance huge ocean liners made their way along the by then pitch-black horizon. Otherwise, only the distant lights of Port Royal in the west and far-away lightning decorated the scenery behind the stage. While the next band Earthkry was getting ready after the last of Phuzzion’s souly voice trios was drowned in a round of applause, the hosts appreciated the fact that the Minister of Youth, Sports and Culture was providing the organizers of the festival with government support. Thanks were also given to the Jamaican Tourist Board. Earthkry kept up the vibe with high quality musical performances of their hits “Hard Road” and “9 to 5.” Before empress Keida finally entered the stage and blessed the audience with Ganja Tea, and Stand for Sometheing, the Mystic Revealers performed supported by a guest appearance of Trigga Finga from Japan, who showed up in his Rasta alter ego as opposed to last week’s dancehall-ego at the Sting launch. After Keida’s performance, the same band backed reggae veteran Carl Digo Dawkins for a short intermezzo. Definitely one of the highlights of saturday night was Pentateuch’s performance of Black Face which was accompanied by a captivating dance interlude by female dancer Nannay Isachar. The band’s lead vocalist Var dedicated this very emotional artistic performance to dancehall singer J Capri who passed away the day before at the University Hospital of the West Indies. He held 10 seconds of silence to remember his late long-term friend. Following that, Kelissa took center stage and shone with a brilliant performance of all her hits. She was supported by Chronixx, Keznamdi and Tessanne Chin. DBurnz, an uprising artiste who I met at the university many times prepared the stage for Jesse Royal and his Modern Day Judas. He was supported by Chronixx, who quoted Jah9 in the verse “I hold the king closest to I heart.” After another guest appearance by Dre Island and Uptown Downtown, Jesse Royal returned with the new love song Next to You and his hit tunes Finally and This Morning. The night has become late until finally the Morgan Heritage family was asked on stage at 2am. Jemere Morgan, Gramps Morgan’s son opened for the rest of the family with International Love and a tribute to Jacob Miller’s Tenement Yard. As usual, Morgan Heritage performed hit after hit in world class quality, which definitely made nobody regret to still be around that late; maybe suffering from a weak knee after being around for so many hours. How Come, Don’t Haffi Dread, and Works to Do (Jah Works) were just a few of the hits that got the audience respond in excitement. After this bombastic performance, Gabre Selassie from Rockers Sound Station sent his best dubs and tunes through Uncle Ronny’s speakers until the early morning. Just like Saturday started of with the Zincfence family, on sunday, when guests had a tendency to arrive a little later than the day before, Iset Sankofa from Sankofa Tuesdays and the EDB family alongside Infinite, Kazam Davis, Naoto and Little Briggy, all associated with Vinyl Thursdays, opened the night with about the same delay than the day before. I could remember this night’s first band called Persons of Interest from another concert in September at Mandela Park at Halfway Tree and was impressed by the young band’s continuous development. Especially remarkable about this band is the unique voice of the female vocalist. Next to Persons of Interest, Earth and the Fullness from Jamnesia and Ras I performed and warmed up the appreciative Wickie Wackie audience. During some technical difficulties were rectified and a broken speaker box was fixed, Equiknoxx Sound kept the audience entertained. Authentic dancehall is sometimes hard to bring on stage, but when the show finally continued with Cherine, everybody in the audience realized that she and her band knew what they were doing. Backed by some powerful samples, which made the stage sound so dancehall-like, the female artiste who is widely hyped for her video and single Haffi Come Back delivered a mad performance and showed of her lyrical talent. After that, the duo around Unga Barunga & Jason Welsh also known as Notis, impressed with equal musical quality. 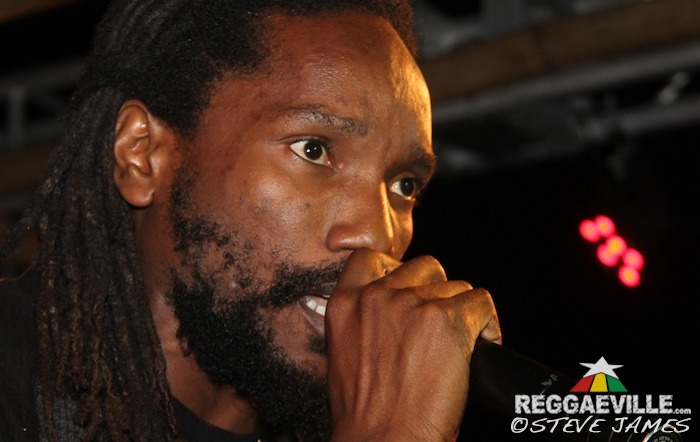 They drew attention to their new single Raggy Road on their self-produced Crossroads Riddim. With Nattali Rize, Notis brought another international artiste on stage and uplifted the audience with the motivational piece Generations will Rize. Next, two flags in red, gold and green were installed for the singing instrumentalists from The Uprising Roots. 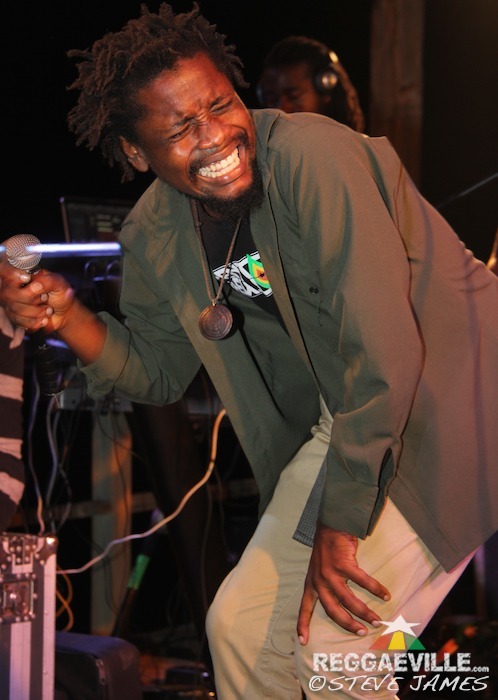 These reggae specialists flooded the audience with far too much talent. Their vocal and instrumental skills were impeccable and full of vibe! The festival came to a musical climax in this very show and with the breeze from the sea getting stronger and stronger and some police men starting to patrol the venue with machine guns, somebody said “no wind from the sea and no police from the street can stop this show!” As part of this climax, Kabaka Pyramid came on stage and performed No Capitalist and made fun of Jamaican politicians with his “Well Done.” Protoje came in with Warrior and Exco Levi and Chronixx also appeared as guests. 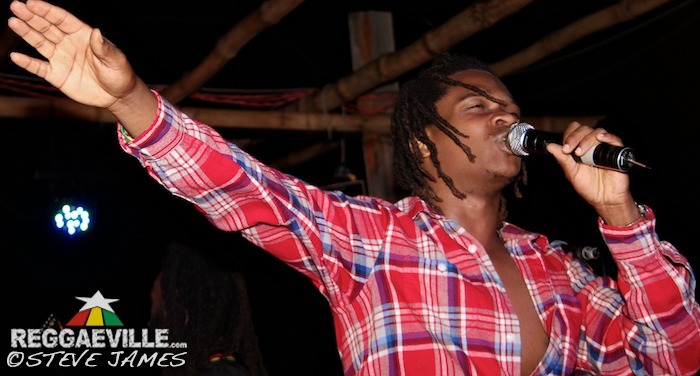 During the last rebuilding of the stage for Wickie Wackie’s final act this night, Raging Fyah frontman Kumar Bent promised everyone that "we nah go let the people dem leave without Raging Fyah", and he stood to his promise by performing at least two songs with his band before the sound was forcefully reduced to radio volume by the police. However, Raging Fyah kept performing in that manner and got loads of applause for their persistence to continue with the show. Eventough the first Wickie Wackie Festival was well attended, it wasn't packed; the organizers counted 2500 guests over the weekend. We saw a wicked line up last weekend and enjoyed an epic venue that united many of Jamaica’s modern day reggae pioneers. Some of the performing artistes have started their careers abroad already, while others still wait for this opportunity. But as one of the hosts said “when you go Wickie Wackie you see di ting from di root and then you ago Sumfest and see di fruit!"